If you missed any of the contest, the 10 finalists were shown here, and you can also view the jerseys which made up Part I and Part II. I want to thank everyone who participated and give congratulations to all the finalists (and participants) and another thank you to all who voted in all three rounds. The USA may be a republic, but we’re a democracy here at Uni Watch. And of course, a special congratulations go to Justin Peterson for creating what was ultimately the winning design. Our friend Steve Rosenbeck from Garb Athletics for offering to create a jersey based on Justin’s design. If you’re not familiar with Garb’s work, check them out on Instagram, on Facebook and on Twitter. You can also see their work (and if you want, order your softball team some gear) from the Garb Athletics website. OK? OK! I hope to announce our next contest soon. As always, suggestions for a “theme” or “topic” for the next contest are always welcome — post any thoughts you might have in the comments down below. …the USFL and the NFL met in a championship “SuperDuper Bowl” following the three seasons the USFL was in existence? What if the USFL and NFL teams met during ‘regular’ season play, establishing new intra-city rivalries? Tremendous job with that, Gene! Of course, those matchups will only exist in photoshops (and probably Madden, right? ), but they never took place on the field of play. But oh what could have been. If only it weren’t for a certain meddlesome owner you may have heard of that liked to sue people, and thus, killed off the great USFL. I have provided updated tracking for the Diamondbacks, Red Sox and Nationals through the month of May. I have also included the Orioles as well. In case you missed it on Thursday, Paul’s latest ESPN column takes a look at all the yellow gold being worn by the four teams in the NBA and NHL finals, and also has his picks for the best “yellow-centric” uniforms ever in each of the major pro leagues. Baseball News: These Shea Stadium(!) beanies will be going on sale beginning tonight at Citi Field I CALL IT SHEA (thanks to Mike Chamernik). 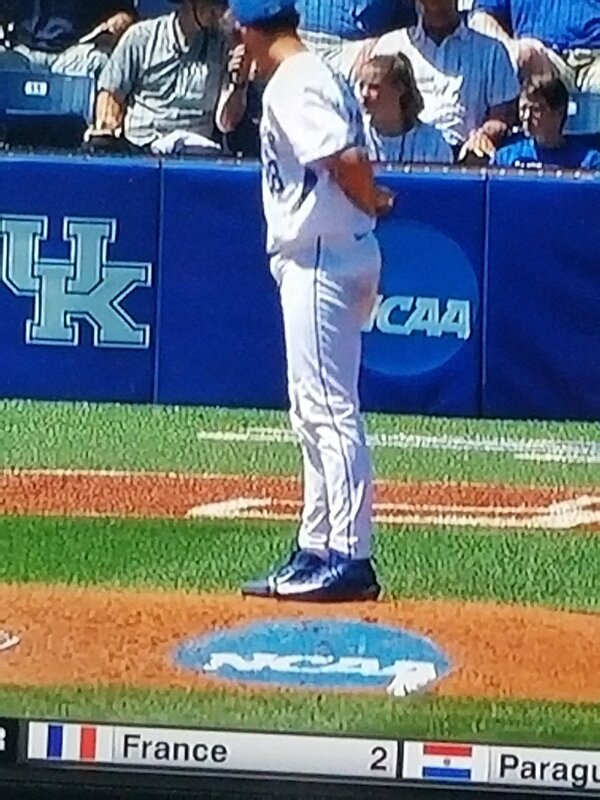 … Kentucky still has the old ‘UK’ logo on baseball field (from James Gilbert). … Pete Rose apparently likes Pete Rose. Like a lot, and stuff (from J. Daniel). 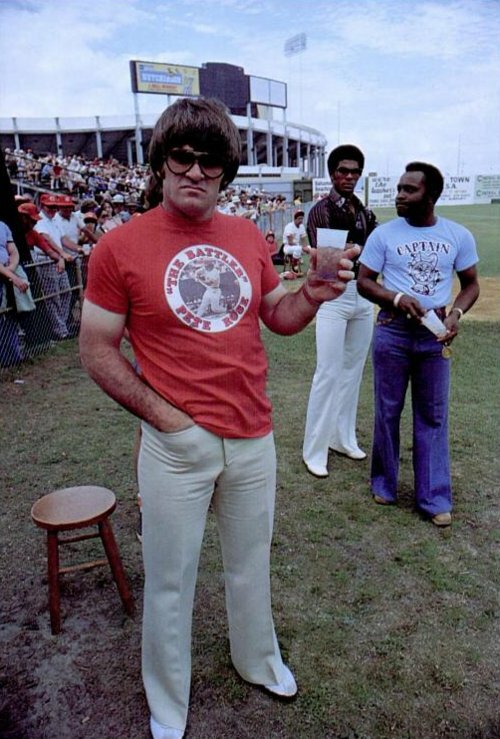 Still, Pete wearing Pete Rose t-shirts is better than Pete not wearing a Pete Rose t-shirt. 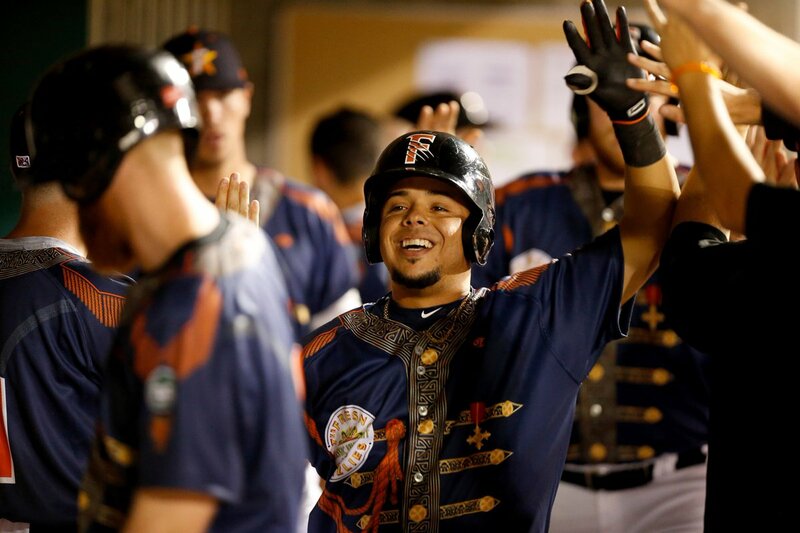 … The Fresno Grizzlies rocked these Sgt. Pepper’s themed jerseys on Thursday evening. Here’s another look. … Oooohhh, check out this Montgomery Ward & Co. catalog of baseball unis26 (circa 1915). Submitted by 216 Sports History. 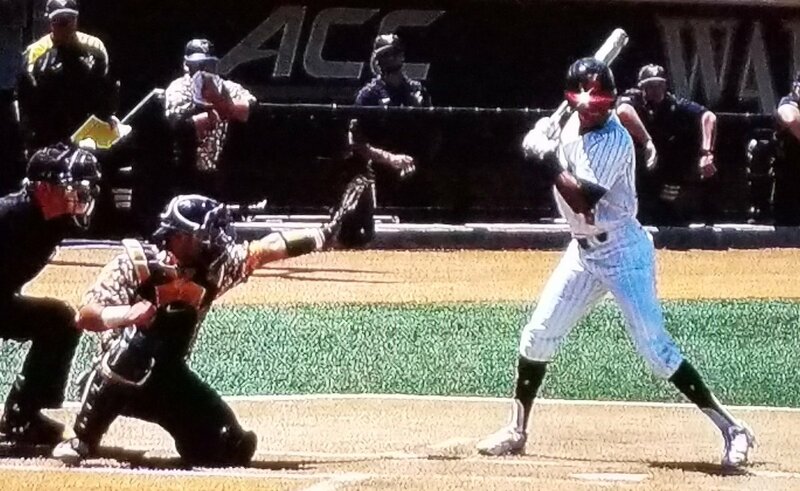 … Weird look yesterday on the ‘Road to Omaha’ (College World Series): In the Maryland/Virginia regional game, the road team was in white pinstripes and the home team in camo jerseys/blue pants. 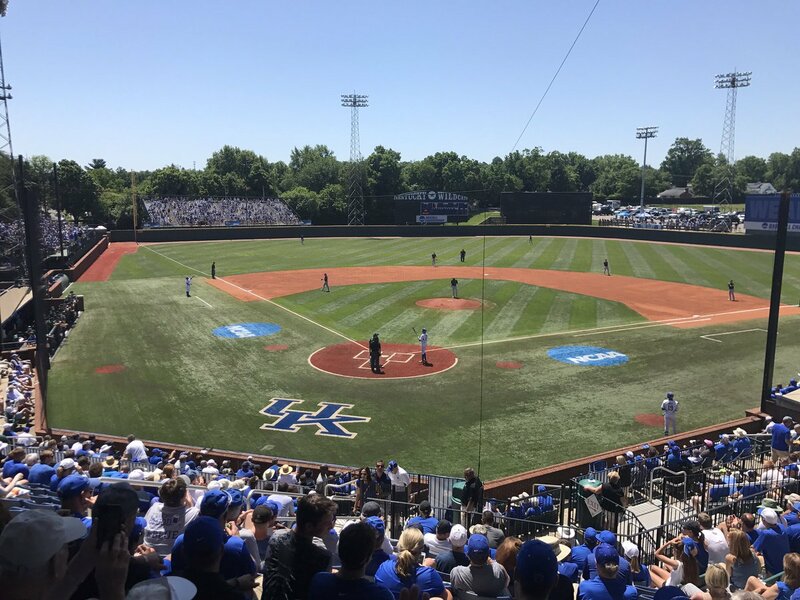 Asks submitter Lenny Vangilder”, “Is this baseball or softball?” … Also from CWS action, “Kentucky is the only regional host I’ve seen so far with NCAA logo on mound,” says Josh Claywell. 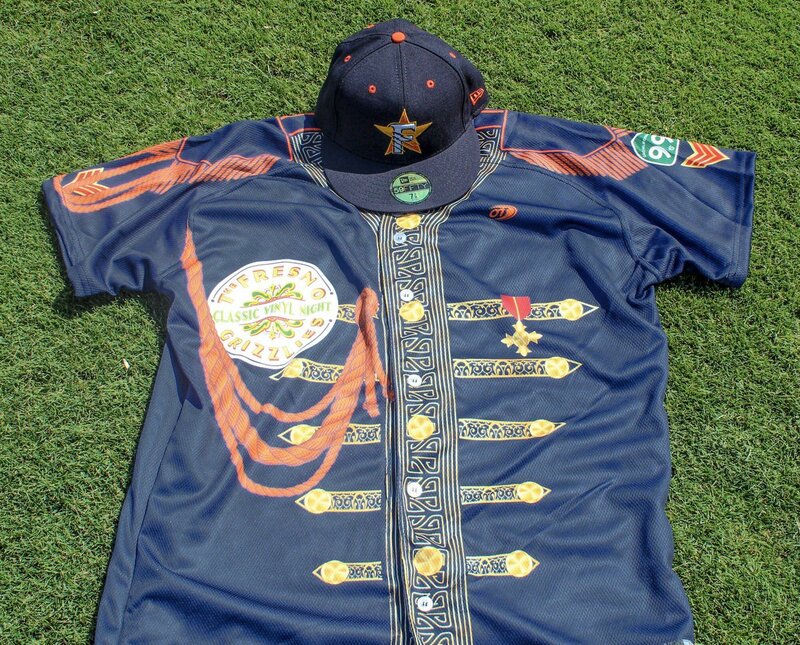 … On Thursday night, the Ashville Tourists wore these “sudsy” jerseys (from OT Sports). … WHOA!!! Check out these Jackie Robinson tribute jerseys the Brooklyn Cyclones will wear on Friday, August 18th. There’s a whole package deal for that night too (h/t to Brooklyn Resident). … Reader Ted Arnold liked this article about the imagery of baseball, which includes this: “Last week, I watched a replay of David Ortiz’s game-winning home run in the 12th inning of Game 4 of the 2004 A.L.C.S. It happened nearly 13 years ago, but it could have been last October, the way the scene was presented: the HD video, the score at the top of the screen, Joe Buck calling balls and strikes. We may be past the point when the only way to distinguish among coming eras will be by the change in uniforms” (emphasis by the submitter). 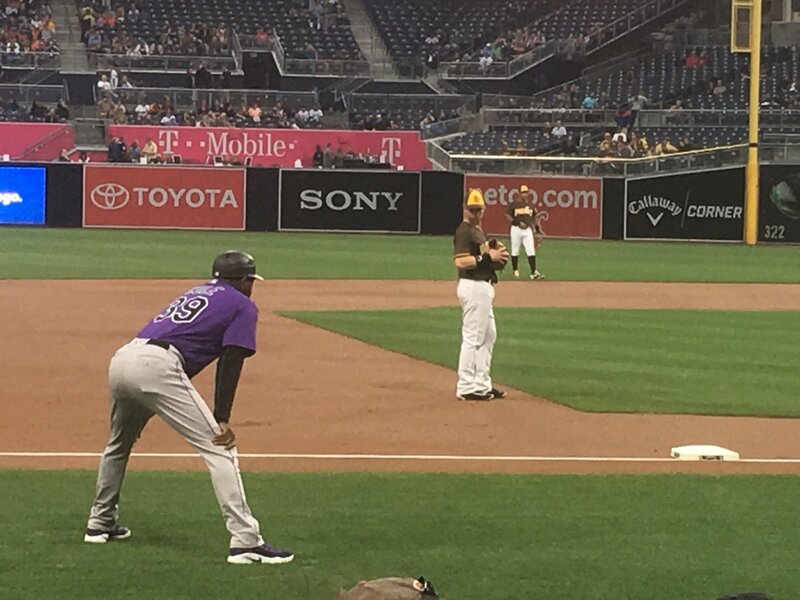 … Josh Claywell asks, “I can’t be alone in disliking Houston’s mound … Am I?” … Sometimes color vs. color softball tops in baseball work (it’s rare, but it happens). Other times, yeah, that’s a nope (from Sam Neher). 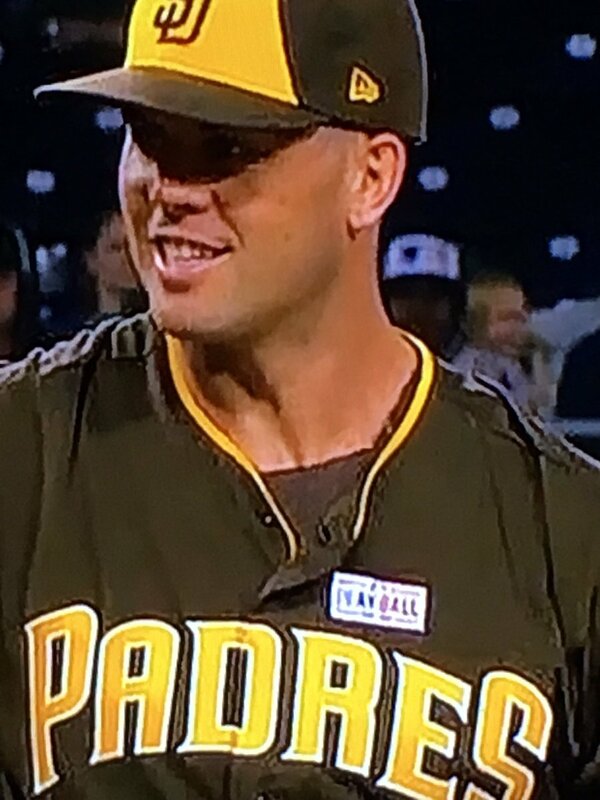 … This weekend is another edition of MLB’s “Play Ball” initiative, and last night, the Padres wore the Play Ball patches on their brown jerseys (from Tim Arzaga). Those patches aren’t affixed terribly well. NFL/CFL/College Football News: The San Francisco 49ers are going to bringing back their old (awesome) helmet cart. Here’s more on that. 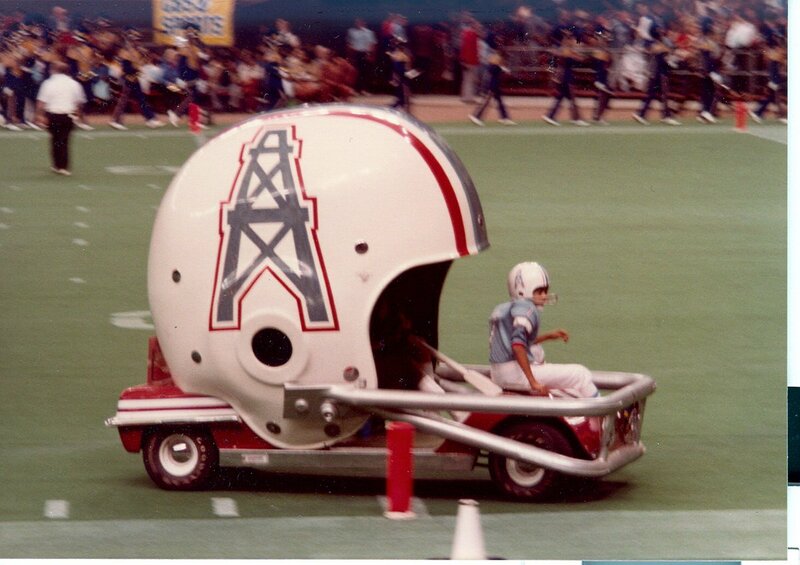 Speaking of helmet carts, here’s a look at the old Oilers one (from minihelmetguy), and a couple from Mizzou (from Nate Stein). … The Chicago Bears usually wear their monsters of the midway throwbacks with gray face masks and no logo. Here’s a picture from an autograph session which shows gray face masks with white “C” logo (from Adam Grad). … The Seattle Seahawks will be honoring Cortez Kennedy this year with a “96” decal on their helmets. … The 2017 Sun Belt Conference Football Helmet Schedule is now available. The linked PDF schedule features the team helmets, date, and opponent for each Sun Belt team. 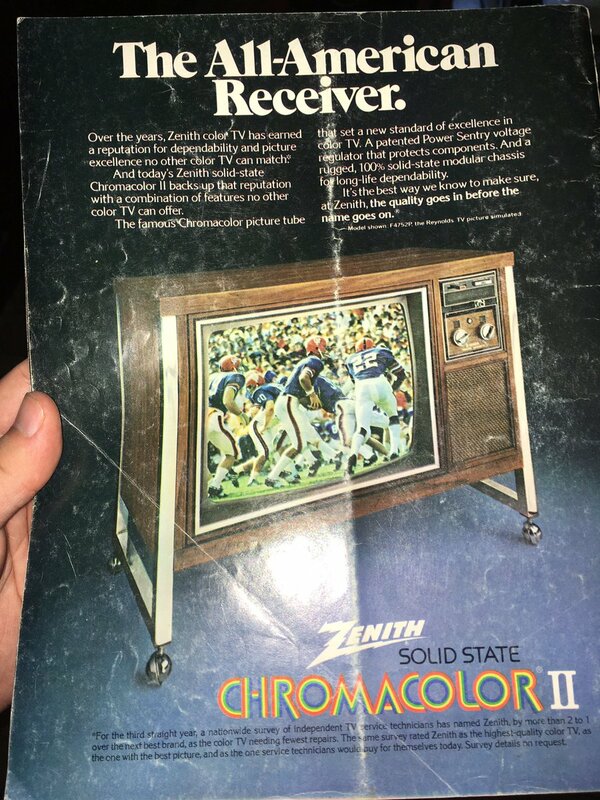 … “From a Youngstown State program from ’74, great TV ad with University of Florida football (I think)” says Robert Hayes. … The NFL has incentivized the equipment industry with $60 million and called for a better overall helmet within three years, and position-specific helmets within five years. Here’s more on the quest for a better helmet (from David Rakowski). … Speaking of better helmets, here’s a good article from WaPo on the future of football equipment and measuring a hits impact on the brain (from Tommy Turner). … So, did you think Nike was going to “take over” Michigan football and *not* do an alternate? You’d probably be wrong. Can’t vouch for this 100%, but I’d say it’s highly likely (from Kevin Patrick). 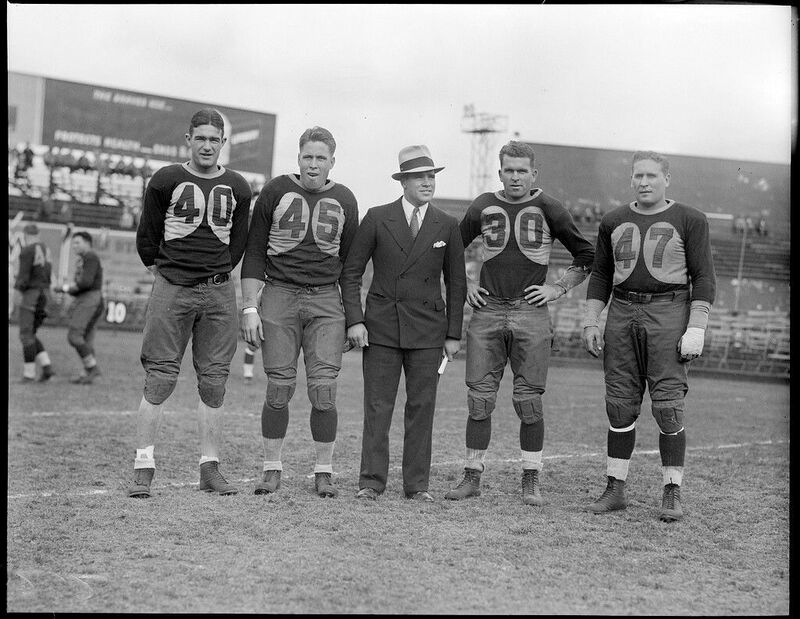 … The Chicago Cardinals rolled out a very interesting uniform design in the early ’30s (from Sports Paper). Hockey News: If you were ranking all the jerseys the New York Islanders have worn in their history, what would be your “best”? What would be your “worst”? Any list that includes the Fisherman as the worst is invalid, but I guess everyone’s entitled to their opinions. At least he gets the two black jerseys correct (though they should be last and next-to-last). NBA/College/High School Hoops News: The first jersey worn by Steph Curry as a member of the Warriors (a special Warriors NBA Summer League jersey for the first time on the night of July 10, 2009 in Las Vegas) is going to be sold at auction later this year (from Rich Mueller). … “What Might Have Been”: check out these 2003 NBA Finals logos which were designed (but went unused) by Uni Watch pal Todd Radom. 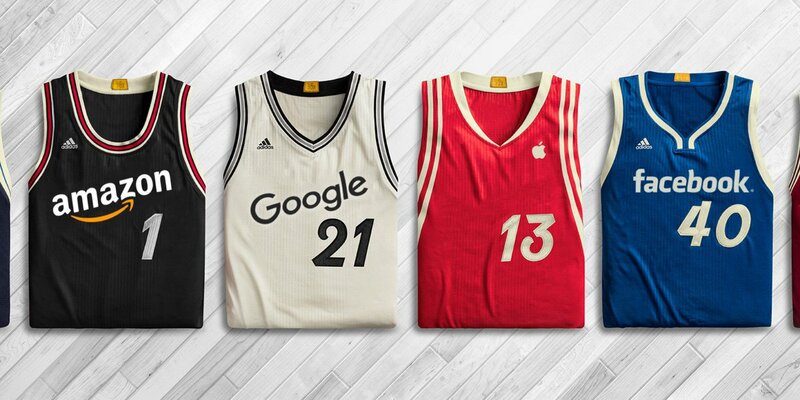 Says Todd, “a fun, retro-influenced look, done at a time when retro was ascendant.” … Interesting graphic here depicting NBA teams as corporations (or vice versa). That comes from this article entitled, “Stop supporting tech companies as if they are sports teams.” Submitter Steven Carlson asks, “Which team is Amazon?” … Here’s a look at the championship rings for the school that won the largest IL high school basketball division, Class 4A (from Mike Chamernik). Grab Bag: “Here are four photos from a display case in the lobby of the main gymnasium at Santa Rosa Junior College, where I work,” writes Daniel Klempner. “The football with the white tips caught my eye initially and then I had to look at everything. The shoulder striping on the other football photo is something we’ve seen before but I can’t recall where. Finally, I don’t know if I’ve ever seen the 1918 jersey logo for the Cubs copied anywhere else (SRJC is the Bear Cubs). Considering Okkonen came out a few years before that photo it made me wonder if that book had anything to do with their 1995 uni design.” … Apparently the latest *thing* is now “University inspired candles” (from James Gilbert). … Liverpool’s quartered jersey takes inspiration from 1892 threads (from Ted Arnold). Theme Uniforms, Uniform Designers, Uniform/Logo Contests, Uniforms in Movies/Advertising/Etc. Oh man. I’m so excited. I want to thank everyone who participated in the contest, there were so many great jersey designs. There’s a ton of talented people who read this blog. Congrats, Justin. Really great work. Can’t wait to see the finished design. We’ll meet again on the field of design battle. Way to go, Justin! Can’t wait to see the rest of the Springfield team wear your design in Radium Stadium. Congrats Justin. Yours was my choice for best in the field. Yikes. I wasn’t prepared for that Pete Rose not-wearing-Pete-Rose-shirts photo!! Same here…the Pete Rose photos got progressively worse, putting a damper on what was otherwise good Saturday content. But that first one, with Joe Morgan and (I think) a slightly-out-of-focus George Foster? 1970s cool at its finest. You’re a madman to think such things, Gene Sanny! Actually, great Photoshop work to bring those thoughts to life. I doubt that the NFL owners would have allowed duplicate teams to exist in many markets. They would persist until the USFL teams moved away or folded. “Pete Rose apparently likes Pete Rose. Like a lot, and stuff.” Pete Rose can go —- himself, and apparently does. “From a Youngstown State program from ’74, great TV ad with University of Florida football (I think)” Definitely Florida. Definitely not Emmitt Smith. I hated the Fisherman logo as much as anyone else, but I thought the overall design of the jersey (with all the ’90s colorful swooshy striping) was pretty cool. I also think the 2011 black third was a solid design, just ruined by an incredibly dull wordmark. If there was some kind of logo on the front instead, it would have looked good. And while I do agree with the general consensus that their Brooklyn black third is ugly overall, I have to give them props for the little “B” logo on the hem. I’ve always thought that was a neat place to put a logo. And finally, I do not like the four stripes that they continue to put in all kinds of places on their jerseys/logos. I get that you want to honor your Cup wins, but it kinda makes it look like you’re not planning to win any more (probably a fair assumption in the case of the Isles, though). Well, the first black jerseys and the orange jersey were definitely worse than the fisherman. My opinion of those uniforms is the exact opposite. I thought the fisherman logo was decent enough, but the seasickness-inducing design of the jersey was nauseating. It would’ve been more tolerable if they had used straight numbers and NOBs instead of trying to conform them to the wave patterns. This was also my pet peeve of the Blues’ uniforms of the time – I really didn’t care for the numbers being mutilated to conform to the angled stripes. That’s some mighty fine work, Gene! One can just imagine the matchups up Novo Bojovic vs Mark Moseley, or Sean Landeta vs Ray Guy. The city matchups remind me…when I used to draw football fields I had a shared one for the Maulers and the Pitt Panthers. I used to imagine shared NFL/USFL fields but I don’t think I ever drew any. I know I thought about doing a Generals/Giants/Jets/Rutgers field…I should make that one for Phil. Nearly all the hypothetical NFL-USFL matchups would have resulted in blowout wins for the older league, but the battle for Tampa Bay would have been interesting. People forget the 1984-85 Bandits outdrew the Buccaneers, and had the coaching advantage with Steve Spurrier. They had a wide-open attack, and none of the locker room dysfunction which troubled the Bucs during this time. While the Bandits would have had problems dealing with James Wilder, this is definitely one game the NFL Bucs would have no interest in playing. Stars would’ve beaten the Eagles. Panthers would’ve beaten the Lions, too. That’s probably it. Lions weren’t bad in ’83…actually won the NFC Central Divison. The picture shows them playing the Panthers with silver number font but ’83 was the first year they wore white number font (wish they stayed with the silver). I struck up a conversation with a stranger in Berlin, WI, who was wearing a Honolulu blue Lions Jersey with the silver numbers back in early 1983. He said it had been given to him by his employer, Medalist/Sandknit of Berlin (the NFL’s jersey supplier), because the league had ordered Detroit to switch to white numbers. The reason? Spotters were having difficulty discerning player’s numbers when time was of the essence. Apparently the NFL is unwilling to learn from history and is doomed to repeat its error this coming season. Wow, that’s fascinating. I never knew that and thanks for the info. Spotters be damned, I will say I’m pleased to see the silver numbers return this year. When did knit hats/toques become “beanies”? I still think of beanies as those little brimless caps that could have a propeller. Or the things that the pledges wore in Animal House. In my book, it’s a knit cap or watch cap unless it has a pompom. In that case it’s a touque. Right, what you are describing is a real beanie. A beanie is also a winter hat that doesn’t have a fold. But those things that the Mets are selling are ski hats, not beanies. And the Shea Stadium ski hat should show Shea how it was was meant to look. 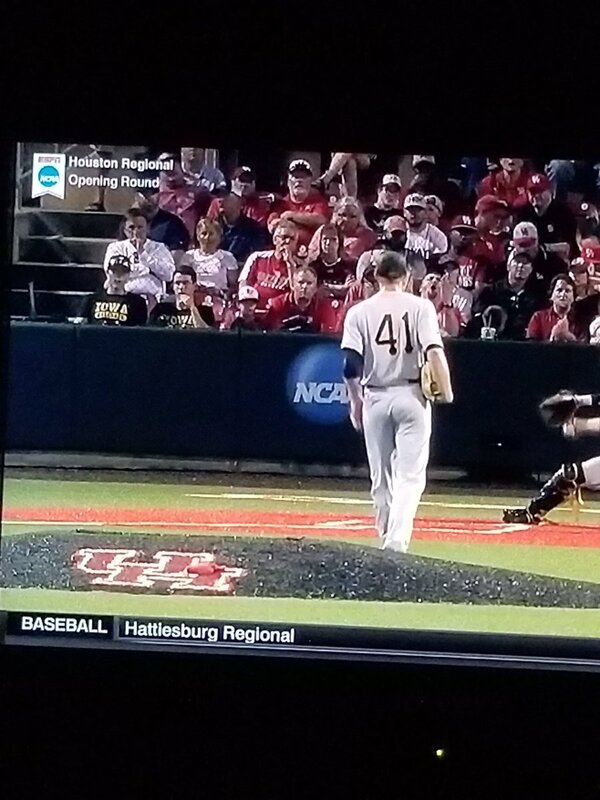 That was Maryland and West Virginia playing yesterday in college baseball. The “Battle of Oakland” could not have happened. It would have been Oakland Invaders vs. Los Angeles Raiders. Invaders/49ers could’ve been the Battle of the Bay Area. Panthers/Lions: I’m Calling It The Battle Of Pontiac. 2nd year Breakers could’ve had a Battle of the Bayou with the Saints. Picturing the field for that one. The SuperDome used to have one end zone for Tulane and one for the Saints. Just paint the Breakers helmet over the Green Wave helmet. Too bad there wasn’t a fourth tenant…it would look weird trying to put three teams on the same field. 3d year Breakers could have had a Northwest Showdown with the Seahawks. Re: Corporations as sports teams – Amazon appears to me to be the Bulls. Apparently Kentucky hasn’t changed logos at its baseball stadium because the school is building a new one. Guess they didn’t want to spend the money to change everything. And yeah, Pete Rose loves him some Pete Rose. But if you played like he did, you might too. Pete Rose is a tool. I used to work for the SEPBL, a now defunct independent minor league. They had a team in Macon called the Peaches. 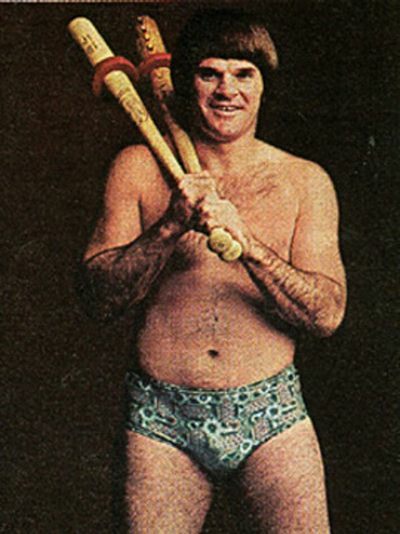 Pete Rose had played for the original Peaches back in the 60s. The SEPBL Peaches who were on a shoestring budget to begin with somehow managed to scrape up enough money for Pete Rose Night. That jerk charged them $25,000 to drive two hours up I-75 to throw out a pitch, sign some of his own memorabilia he had brought with them, and left after the 7th inning. Didn’t even say a word to their manager Todd Hogan who was working for free that season or to any of the players who were getting $50 a game and making bus trips to Baton Rouge and Montgomery. Hope his ego was juiced enough from big timing a bunch of hard working kids and I hope he blew the whole wad at the dog track. Any reason the Feds vs Snyders is shown being played at Veterans Stadium and Riggo’s wearing his ’83 kit while the Feds are in their ’84 set? Btw the #47 Feds jersey worn in the mashup pic by Mike Thurman used to hang in my memorabilia closet until my ex wife made me eBay it. The Federals had sweet uniforms. The silver/kelly green/silver uni combo is not utilized enough. It is a nice combo. I preferred the ’83 uniform with white helmets. 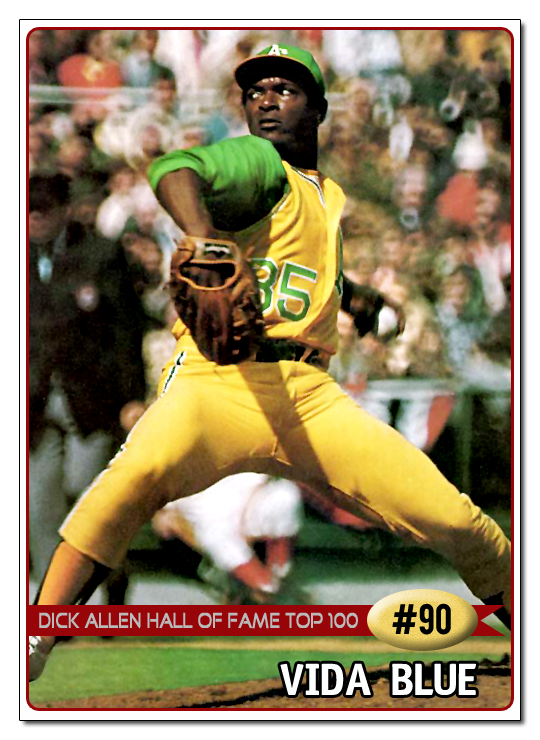 Their ’83 green jerseys were delayed so they wore white for every game until about halfway through the season. Thanks for the clarification and aside from my nitpicking, great work! Liverpool’s new away kit of quartered green-and-white shirt harks back to the club’s first jersey in 1892. Those NFL/USFL photo illustrations were one of the coolest things I’ve seen in a while. The photoshopping quality was amazing…I’d bet that if you showed most of those to a non-football fan (who wouldn’t recognize that those teams never played) most wouldn’t realize they were not real. If Lee Roy Selmon’s stature was shortchanged, this fan of his considers it a minor oversight. If you ever saw Lee Roy play, you might think he was eight feet tall also. I tried to get the helmets to be about the right size compared to each other, and from there it was about covering up the actual player in the photo that was trying to tackle Gary Anderson. Really good work on this project Gene! Much appreciated. The photos are quite impressive. Like I said, very minor complaint, and the photo is still kind of awesome as it makes Selmon look scary as hell, kind of a Darth Vader in creamsicle orange. Of course, those matchups will only exist in photoshops (and probably Madden, right? Actually, no. Madden did include NFL Europe teams for a couple years during the PS2 era, but has never had a detailed enough create-a-team option for anyone to really recreate USFL teams. I remember those days. I don’t think they had every NFL Europe team in the game, but they had a few of them for sure. In response to Daniel Klempner’s contribution, the reason why the Bear Cubs had a 1918 Chicago Cubs logo on their jersey is almost certainly that 1918 was the year the Santa Rosa JC was established. The teams are called Bear Cubs as the institution was originally established as a feeder school to the University of California. Full disclosure: I’m a SRJC alum, as is everyone in the last four generations of my family. Generally do not admit this as I graduated elsewhere. The NFL/USFL matchup shots are beautiful. But … Brian Sipe?? Problem is, you’d have to colorize him before you photoshop him. 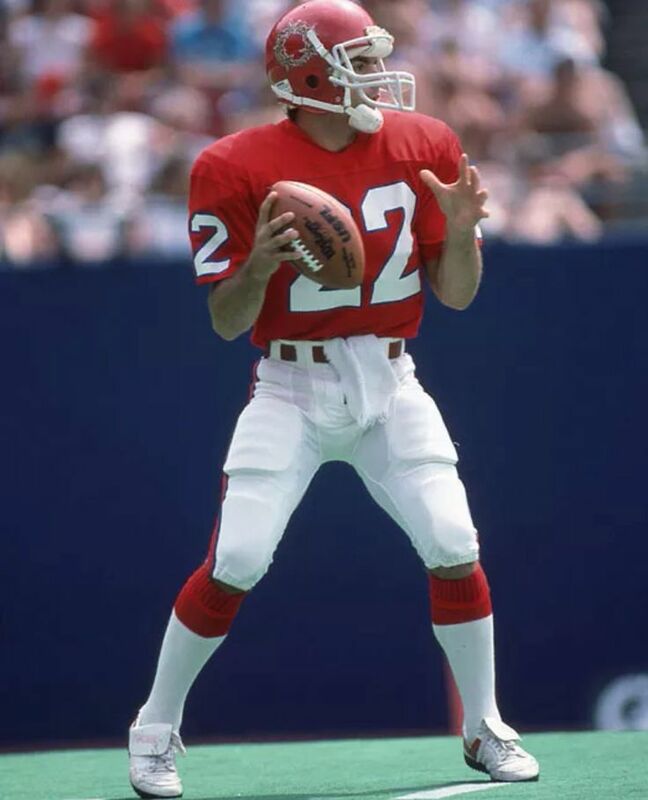 All of the NFL vs USFL pics were driven by the USFL photos, because there are far less quality photos of the USFL, other than the Generals, Gamblers, and Express. So I had to go with what I could. 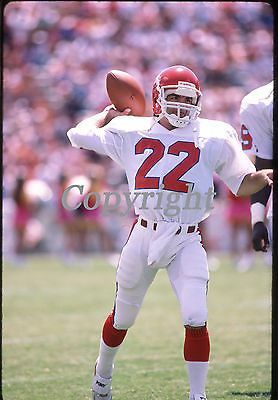 Besides finding similar lighting, proper light vs dark jersey matchups, and just overall quality, I also had to find pics where background sideline players weren’t from the team that was actually playing against the USFL team I used the picture of. It took way longer to research pics than it did to do the photoshop work. After I posted these on a USFL facebook page, I some some other guys try it, and they had color vs color, differences in lighting etc. I know there are a few issues here and there, but I’m proudest of the Rams/Express because of the depth and layering, and the Raiders/Invaders because I was actually able to get it to look like they were interacting. It’s easy to just stick a player in a shot, but not to get it to look like a guy is wrapping up on a guy he’s not actually in the same photo with. I appreciate the challenge of finding appropriate photos, which is why I selected those two particular shots of Doug Flutie in my earlier comment. They would meet the needs of this project, would they not? Anyway, congratulations on some excellent work, and thanks for giving us a glimpse at an alternate universe. The USFL photos remind me…whenever a team decides they need a complete overhaul, they should consider the Michigan Panthers’ old color scheme. Apparently, their colors where known a Royal Plum, Champagne Silver, and Light Blue. They looked great together and were a totally unique color combo that I’ve never seen before anywhere in sports. Not sure if “plum” is close enough to purple to earn Paul’s wrath, however. As requested, here are a few suggestions for a future design contest. Sorry if any of these have been done. – Pick a team that either has been defunct since at least 1970 (or moved and changed nicknames) and create a design that they might be wearing today had they remained. – Pick a team that was established after 1975 and design a uniform they might have worn in 1960 or prior. – Pick a well-known modern artist (for example, Andy Warhol or Jackson Pollock) and imagine a current team asked them to design uniforms in their signature style. – In the spirit of the LA KISS (Arena football), imagine that a famous rock band bought a team and renamed them after themselves, with a uniform featuring their logo or other trademark design elements. – Redesign a well-known public university sports team’s uniforms if a law was passed saying that the schools had to use the colors found in their respective state flags. – Imagine that the major sports leagues passed a rule that only on team was allowed per metro area, so teams like the Yankees and Mets, Cubs and White Sox, Jets and Giants, etc had to merge and decide which colors, names, and design elements to share. I have very weird weird opinions on the Islanders jersey history (for the sake of ease, I’m counting the 72-95 and 10-Present jerseys as the same even though there have been some pretty large tweaks). I’m also ranking home and away as one set. Yes, I actually like the 2011 alternate as an alternate. Da Bears with white “C”…YESSSSS!